To earn Rs 150 crore from retail stores by year-end. Canon India, the imaging brand, is focusing well on its portfolio to broaden revenue streams. It has been slowly diversifying its portfolio. Canon, known as the camera maker, had also entered into the printing and management services which are outsourced to them. Launched two years ago, Canon India has already tied 65 large enterprises for the same. “This segment accounts for almost one third of the B2B office imaging business,” says Alok Bharadwaj, Senior VP, Canon India. Canon earns upto Rs 100 crore annually from commercial printing. For this Canon had acquired a Dutch based company, Oce, that made large printing presses for printing books and bills a year ago. “Customer service management is our investment focus at present and we are also open to exploring medical imaging in future,” says Bharadwaj. 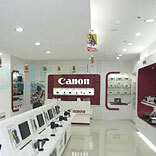 Canon also plans to expand its retail base to 300 stores by 2014, spread over 100 towns and also plans to earn upto Rs 150 crore by year-end from its retail stores. It currently has 70 retail stores selling only Canon products in 42 towns.